1920s extending caravans - possibly homebuilt? Homepage. 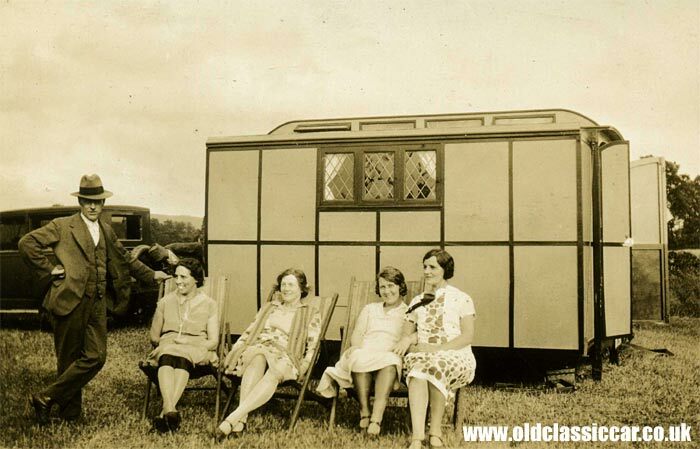 This page: Four vintage photographs showing two unusual old caravans, complete with leaded windows and skylights. I bought these four photographs a little while back. At first I thought they might show a pair of Eccles caravans, but I'm told at least one could be one-off, home-built, caravan, I guess dating to the 1920s or 1930s. If they ring a bell with anyone, please get in touch and I'll update this page. Perhaps both were homebuilt, or maybe one was built at home, and the other a factory produced model? 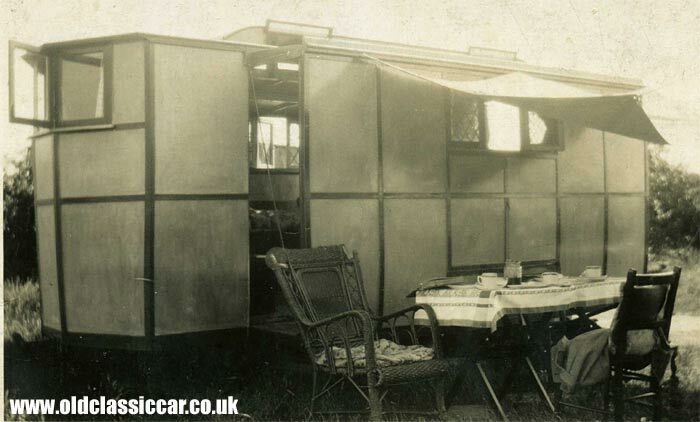 The first two photographs show a 1920s caravan, that appears to have an extendible front section. The first photograph is perhaps clearest of the lot. It shows four chirpy looking ladies, three sat in proper old-style deckchairs, and the fourth perched on a stool. To the left is a dapper chap, dressed as a gentleman should be when en vacance, complete with waistcoat and trilby - no baggy shorts or tins of beer to be seen. Just visible in the background is the sturdy towcar, a better view of which can be seen further down this page. The caravan's lantern roof can be clearly seen, as can the three diminutive (leaded) side windows. The caravan's two rear doors are open, at the rear. Caravan photograph number two (this time printed on card, as opposed to the Velox paper of picture one), shows the front 3/4 of this 'van, now with the front section extended outwards. Note the 'V' profile to the caravan's front panel, and a simple sunshade fitted to the side. At first I thought all four photos showed the same vintage caravan, but a closer look reveals that the 'van in pictures three and four, is quite different to the one shown in pictures one and two. I think they both belonged to the same family though. It is possible that the caravan was extensively modified over time, which may explain the differences between pics 1&2, and 3&4, but for now I think they are probably two different caravans. Picture three, shown above, shows the rear of this caravan (note - just a single door glazed door, instead of the two unglazed doors of the previous 'van). This caravan has extending sides, as can clearly be seen in this photo, and a sizeable awning to the side. Note the car's registration number, UK3486. Finally, photograph number four, now showing the front of the second caravan. Whereas the first 'van had an extending front panel, with 'V' profile, this caravan has a flat front, with three small 'bay' windows. Again the extended side panels can clearly be seen, as can the tow car - possibly of US origin? Pictures three and four were printed on SELO photographic paper. Return to the classic caravanning section of oldclassiccar.